Ebizome is a lovely and soft orchid-magenta colour. It's not a hot pink nor is it cool purple it's in between and rather soft. The ink has good performance all around but isn't the wettest sailor ink. 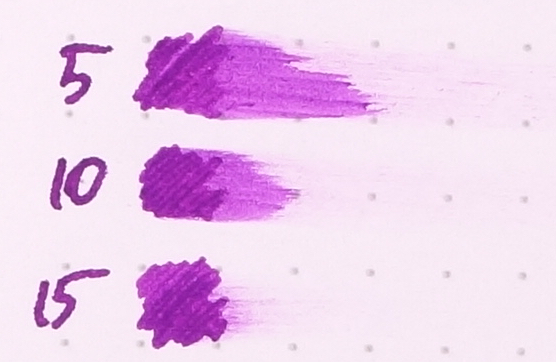 This doesn't mean it's a dry ink though as Sailor inks in general are pretty wet so this is probably still a "wet" ink just not very wet and it is still well lubricated. On paper it performs very well with very limited feathering on cheap copy paper and a composition notebook neither of which are at all fountain pen friendly. There isn't much sheen on this ink. When it's very wet and only on sheening paper like Tomoe River you will get a very subtle green sheen if you look closely. Chromatography is pretty interesting; it goes from a hot pink to purple and to light blue. The light blue dye is clearly there to cool the colour (as well as make it more purple). Dry time is pretty fast on Rhodia and average on Tomoe River. The ink has no water resistance. 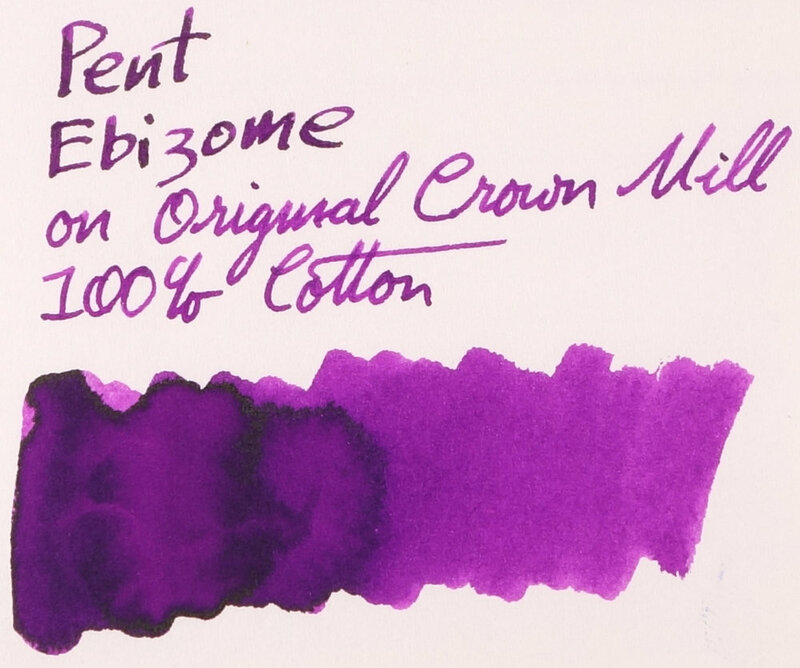 It was probably not the best idea to try and match KWZ IG Violet #3 with Ebizome. 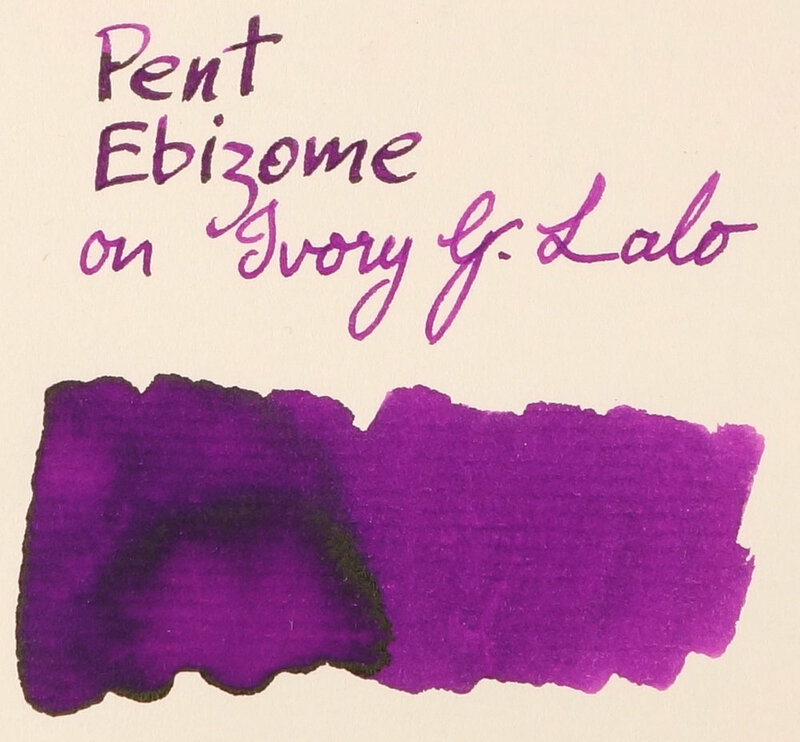 The reason I did was that the swatch on the bottle is relatively comparable to Pent Ebizome but unfortunately the oxidisation of the IG definitely darkens the ink way too much. 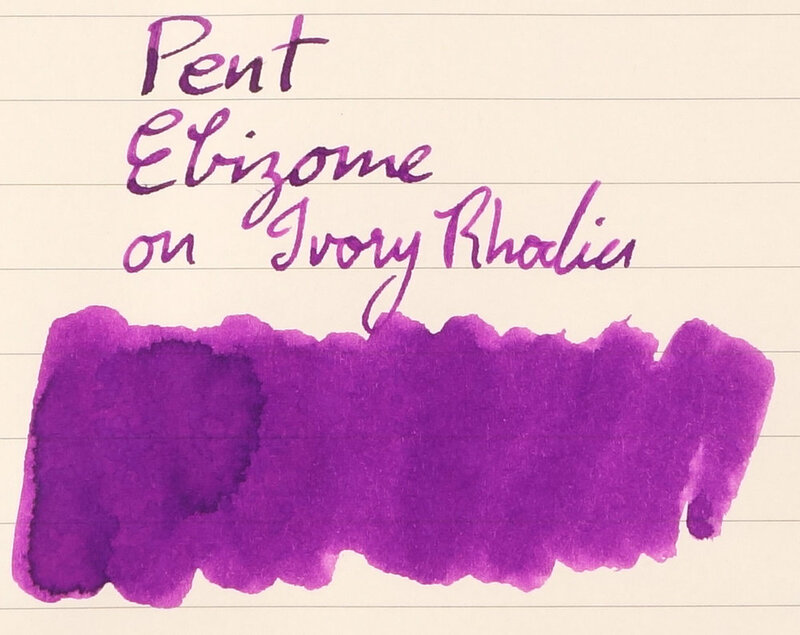 Noodler's Tchaikovsky, ignoring the clearly average-to-poor performance is actually surprisingly similar in colour to Ebizome. I don't recommend this is an alternative however but maybe if you wanted a permanent or water resistant alternative? Bungubox L'Amant is basically the same colour but richer, darker and with much more sheen. Montblanc The Beatles Psychedelic Purple is not bad but is definitely more blue. Noodler's Cactus Fruit Eel goes the other way; not bad but too red. On Tomoe River the Darkness of KWZ IG Violet #3 is even more extreme. Here Noodler's Tchaikovsky isn't nearly as similar and is too pink (though performance on paper has improved). Bungubox L'Amant is still a little too dark and Cactus Fruit Eel is still too red.. Montblanc Beatles is interesting because on Tomoe River the magenta elements of the ink come to the fore and the ink doesn't look too dissimilar on this paper; it's still too blue of course but much closer here than on Rhodia. 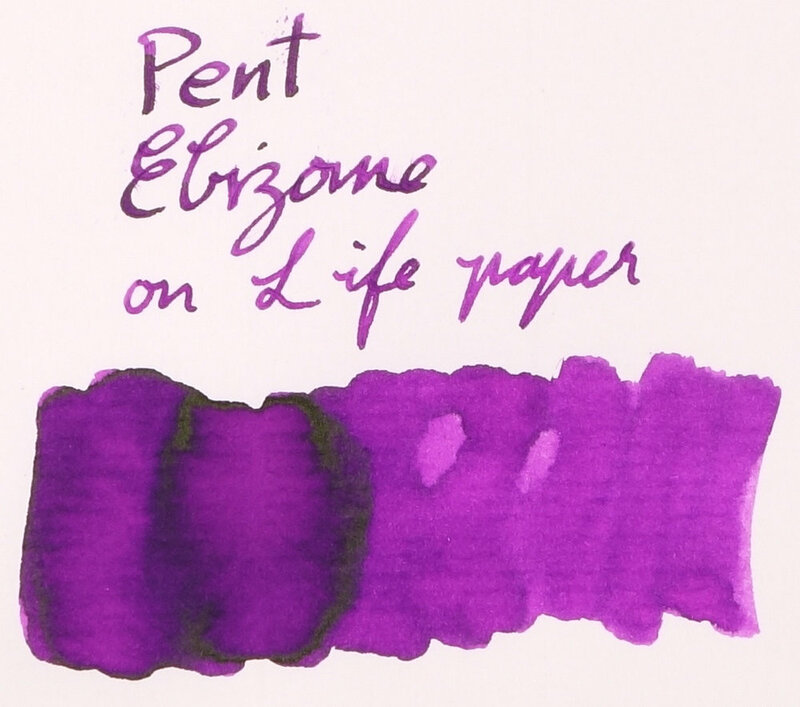 Comparing sheen isn't really that relevant due to how minimal sheen is on Pent Ebizome. That said it is a green sheen so the sheen present on Bungubox L'Amant is similar being another green (but a lot more is present on L'amant than on Ebizome). Montblanc Beatles also has a sheen but is a gold sheen. None of the rest really have a sheen except for maybe KWZ IG Violet #3's somewhat silver appearance. Here I have just shown, in more detail, how Pen Ebizome compares to Bungubox L'Amant. L'Amant is an ink that retails in the US for around US$43 so this is a rather pricy ink and so the savings of Pent Ebizome (which Vanness have for US$31) might be welcome. Personally I prefer the darker and shinier L'Amant but the difference might not be with the extra US$12 to you. An ink that I have a swatch of (but not a sample of) is Kingdom Note Thysanostoma thysanura. This is an ink that has been compared by a few people and suggested as an alternative to Bungubox L'Amant (within Japan the Kingdom Note ink is cheaper than L'Amant but when you factor getting the ink outside of Japan the differences in price are negligible as Kingdom Note do not ship outside Japan and you'll need to find away around that). Comparing these swatches all on the same card stock Pent Ebizome and Kingdom Note Thysanostoma thysanura are relatively similar and both are lighter than L'Amant and neither have as much sheen. If anything the Kingdom Note is a little pinker than Pent Ebizome. I love this soft magenta colour pallet. It's a really beautiful colour which is why L'Amant is one of my favourite inks. 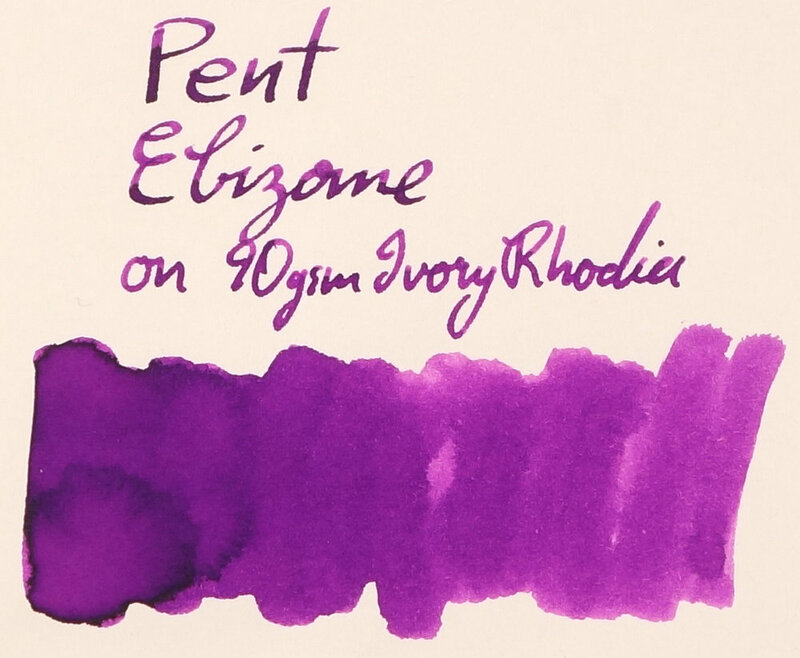 Pent Ebizome isn't one of my favourite inks but it is still a great ink that I find really beautiful. The box this ink comes in also isn't the same standard square box you usually get with Sailor's squat bottles but a custom light pink box for Pent. This is nice touch. If you like this type of colour and the performance of Sailor inks (though this is a tad drier) I think its well worth the cost. 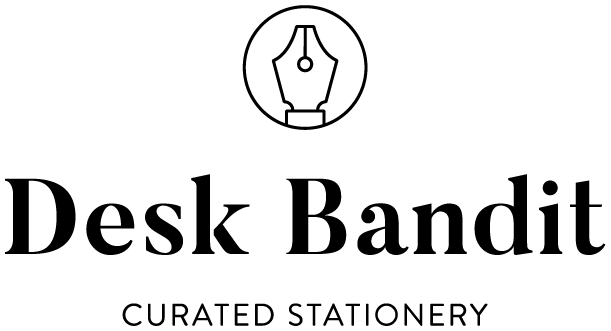 You can buy the inks from Vanness Pens in the US or direct from Pen-house on Rakuten. I've listed all my inks (and my inks by colour) and all my pens in their respective pages. Please let me know which inks you'd like to review next via the comments, Twitter, Instagram, or contact me directly.